Stand Up Paddle Boarding on the River Thames in London at night. It’s dark and cold and I am standing on a wobbly board in the middle of the River Thames. It’s an odd sensation, standing on water, but that’s what Stand Up Paddle Boarding, or SUP, is all about. I’m here with Paul Hyman from Active360, a new outfit which is promoting SUP in west London. Paul has been actively paddling and coaching on the Thames for many years, and was bitten by the paddle boarding bug a few years ago, when he first saw surfers using paddle boards to catch the waves in North Cornwall. 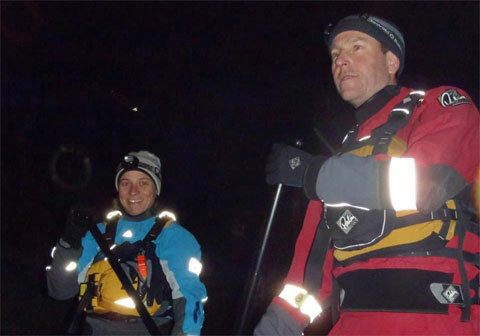 Heading out onto the river on this unseasonably chilly March evening seems almost foolhardy, but Paul is confident we will remain upright and dry. I’m not so sure, and decide to stay kneeling for awhile, just to be on the safe side. This works well, but my fellow paddle boarders, my friend Barbara and Nicholaas from Sportscene, are soon on their feet and my pride forces me shakily upright as well. Once I’ve worked out where I want my feet to be, with Paul’s advice, the board feels remarkably stable. The paddle board anti-slip coating provides a secure grip for my feet, and slightly bent knees allow me to flex with the board’s motion. Together, we make good progress upstream, against the first stirrings of the ebb tide. We start at Kew Bridge, and paddle past the Thames islands of Brentford Ait and Lots Ait. Brentford Ait was once home to an infamous 18th century pub called The Swan or Three Swans, but the island’s main residents now are herons, who nest in the high branches of the trees. Once past the aits, we turn into the Brentford Dock Marina. From the darkness of the river, the lights and background noise of London seem very distant. We practice manoeuvering and attempt some photographs, but it is hard to line up a good shot when everyone, including the photographer, are drifting off at different angles. Having explored the dock we return to the river and catch the tide back home. With the tide and the wind behind us, the ride home is much faster. We have the river almost completely to ourselves, with only the occasional shouted greeting from a passing scull, out for an evening practice. I absolutely love it! If you want to try Stand Up Paddle Boarding in London, Brighton or Essex, check out the Active360 website. They do a wide variety of trips and you don’t need any prior experience to enjoy this fun water sport. 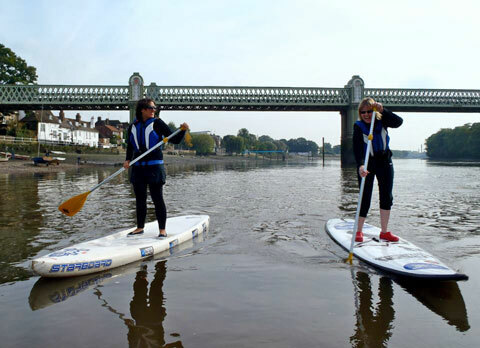 For more information on the Stand Up Paddle Boarding scene in London – check the Canoe London guide to SUP in the link below.